Explore our many arts & crafts, role play, manipulation, and sensory bin workshops before surprising your little leprechauns! Sit in a circle and discuss St. Patrick's Day. Show your group a leprechaun. You may use a figurine or a cardboard version of the famous St. Patrick's Day character. Ask children to close their eyes. Hide the leprechaun within the daycare. When you give them the signal, children search for the leprechaun. As soon as a child finds it, he must bring it to you. Stick a small shamrock sticker on his sweater. Invite children to sit back down. The child who found the leprechaun hides it for the next round. Before children arrive in the morning, glue shamrocks throughout the daycare using contact paper. Use everything you have which is green to decorate the daycare. Let children guess what your next theme is. 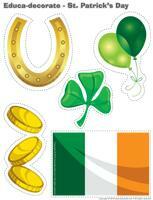 (Open educa-decorate-St. Patrick's Day) Print, cut out, and laminate. Decorate your walls and hang decorations from the ceiling to create a special atmosphere for the theme. Provide as many green toys as possible for great St. Patrick's Day fun. The pictures may be used as a memory game or to spark a conversation with your group. Use them to decorate your daycare or a thematic corner. 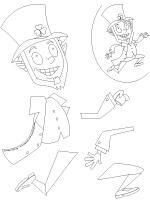 (Open picture game - St. Patrick's Day) Print, laminate, and store in a Ziploc bag or in your thematic bin. (Open observation sheet-Square) Print for each child or laminate for use with a dry-erase marker. 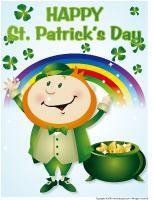 (Open educa-nuudles-St. Patrick's Day) Print for each child. Have children color the sheet. 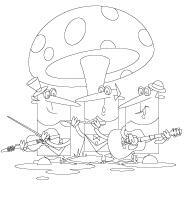 Once they are done, they may use Magic Nuudles to turn their coloring page into a three-dimensional work of art. Variation: If you do not have Magic Nuudles, ask children to fill the spaces designed for the Magic Nuudles with bingo markers or stickers. 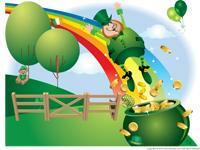 (Open perpetual calendar-St. Patrick's Day) Organize a special green-filled day. Have fun exploring all things green. For lunch, use food coloring to transform foods. Serve shepherd's pie with green mashed potatoes. Cook spaghetti and add food coloring to the cooking water. Add a drop of green food coloring to children's milk. Serve broccoli, cabbage, green beans, peas, etc. For dessert, prepare a fruit platter which includes honeydew melon, kiwis, green apples, and various dips such as caramel, cheese, pudding, etc. Use a shamrock-shaped cookie cutter to make cookies for snacks. Children can cut their own cookies. Let them decorate them with green icing. Replace a few light bulbs with green light bulbs. Hang green Xmas lights to create a special St. Patrick's Day mood at lunch time or naptime. Invite children to wear green and white clothing. Encourage free play. Have children dance to the sound of Celtic music. This special day is perfect for introducing them to rhythms from around the world. Prepare a surprise activity. You may paint a shamrock on each child's cheek. Make St. Patrick's Day hats. Have a treasure hunt. Children can search for tiny shamrocks. Wooden blocks, LEGO blocks, or any other type of blocks...green ones only! Use a green tablecloth or a piece of green fabric to cover the floor. Paper shamrocks are perfect for decorating the walls. Use any figurines you may have which represent the imaginary world such as elves, gnomes, trolls, or Smurfs. Markers, waxed crayons, wooden crayons...all in different shades of green. Glitter, metallic confetti representing shamrocks, rainbows, gold nuggets, etc. Coloured salt which may be glued on drawings to add depth. Add green food coloring or green glitter to glue or use store-bought glitter glue. Green chalk used on dark sandpaper. Green paint which may be used to make shamrock prints with cookie cutters or prints cut out of potatoes. You can also dip the cookie cutters in white glue and sprinkle with glitter. Green, gold, white, and metallic pipe cleaners along with tissue paper for making flowers. Stickers shaped like shamrocks or imaginary characters...or just plain green stickers. Ribbon of all kinds for making rainbows. Green sheets of paper (photocopy paper) to draw on. A leprechaun costume: hat, tights, green shirt, etc. Create a dress-up chest which includes only St-Patrick's Day clothing...only green clothing items! Makeup and mirrors...supervision is necessary! Green modeling dough, store-bought or homemade. Stimulation bottles filled with green food coloring, glitter, hair gel, confetti, pieces of plastic plants, etc. Little ones love playing with them...and older children love inventing their own games with them too! They can easily be used in your kitchen area. Prepare a bin filled with green fabric. Explore textures. This is great for young children (tulle, cotton, velvet, etc.) Fabric stores usually sell fabric scraps. Green, yellow, and white lacing beads. 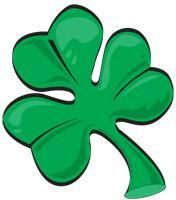 Collect items related to St. Patrick's Day. Invite children to observe them. Hide them with a blanket and remove one item. Children identify the item you removed. Books about St. Patrick's Day, Ireland, leprechauns, or rainbows. Hang green Xmas lights in your reading area to create a relaxing mood. 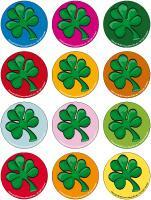 Display pictures of Ireland or shamrocks on the walls of your reading area. Sequential story related to the theme. Glue several shamrocks on the floor... children will enjoy hopping on them, playing a musical shamrock or Twister game...the possibilities are endless. Treasure hunt...children search for shamrocks within the daycare or outdoors. Parachute games involving a large quantity of shamrocks. You may use confetti, pompoms, or any other green item. Large containers filled with green-coloured salt or sugar and green objects. A large container of green Jell-O. (Open game-This is my spot-St. Patrick's Day) Print two copies. Secure one copy of each illustration on the table using contact paper. Drop the other copy into a bag. Have children take turns picking an illustration to determine where they will sit at the table for the day. You may also use the illustrations to determine their naptime spots or their spot in the task train. (Open colourful shamrocks) Print, laminate, and set the shamrocks on the floor to form a path which leads to various areas within the daycare. The path may lead to frequently visited areas such as the bathroom, the cloakroom, etc. 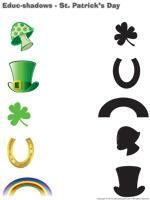 (Open educa-decorate-St. Patrick's Day) Print and assemble the various pieces as a mobile. Hang from the ceiling within the daycare or over your changing table. Explore the color with the infants under your care. Simply place a large sheet of paper on their high chair tray and add a spoonful of blue paint and a spoonful of yellow paint. Let them mix the colors using their fingers. Purchase a piece of turf carpet. Deposit it in a corner of the daycare. Infants can explore the unique texture while exploring green once more! (Open gold pieces) Print and laminate several copies. Use your parachute to throw the gold pieces up into the air. 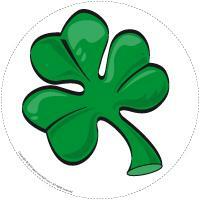 (Open lacing-shamrock) Print, cut out, and laminate the shamrock. Punch holes around the contour. Children use string or a shoelace to lace the shape. Children take turns wearing a silly hat. Create an obstacle course, depositing shamrocks throughout. Children must either avoid the shamrocks or capture them, depending on your instructions at the starting line. This activity may also be done outdoors. Blow up four or five balloons (green of course). They must never touch the floor! You may give children more difficult instructions such as not touching the balloons with their hands, or blowing on them, etc. Give your group instructions like you do when you play "Simon says". However, you must say, "The l eprechaun says," instead. You may give instructions related to St. Patrick's Day. For example, you may ask children to give a friend a piece of gold. Trace, cut out, and glue shamrock shapes on the floor. Children must hop on the shamrocks. Ask them to hop on one foot, hop backwards, forward, sideways, etc. Where are the leprechauns hiding? (Open Leprechaun figurines) Print. Hide hundreds of tiny leprechauns in the yard. Each time a child finds a leprechaun he must say, "I found a leprechaun!" Collect all the leprechauns. Use a long rope to make a giant shamrock shape on snow. Use spray bottles containing green water to fill the shape. If the snow has already melted, you can make your giant shamrock using green chalk. Select one child to be the leprechaun. Whenever he touches a child, the child must stand still, like a statue. Another child must give him a hug to free him. This game is packed with hugs! 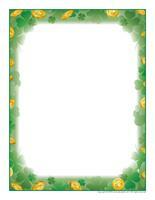 (Open educ-shadows-St. Patrick's Day) Print and laminate for durable, eco-friendly use. Children must draw a line to the shadow which corresponds to each illustration using a dry-erase marker. 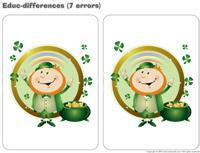 (Open educ-differences-St. Patrick's Day) Print and laminate for durable, eco-friendly use. Children must find the number of differences indicated on the sheet and circle them with a dry-erase marker. (Open educ-math-St. Patrick's Day) Print and laminate for durable, eco-friendly use. Children must count the objects in each rectangle and circle the corresponding number. 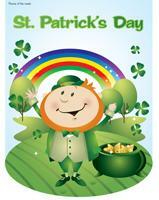 (Open educ-same and different-St. Patrick's Day) Print and laminate for durable, eco-friendly use. Children must circle the illustration which is different in each row. (Open magnifying glass game-St. Patrick's Day) Print and laminate the board game and the illustrations. Cut them out and store them in a box or in a plastic bag. Children pick an illustration and search for it on the board game, using a magnifying glass. Once they have found a match, they deposit the illustration in the correct square, on the board game. (Open hunt and seek-St. Patrick's Day) Print. Children search for the items in the illustration. Have fun inventing an imaginary leprechaun story with your group. Include as many St. Patrick's Day items as possible. Write down the story. When the story is complete, invite children to draw the illustrations. Children love imaginary worlds! Use (Crayola) markers to color on coffee filters. When children are done, use a spray bottle to make "rain" fall on the filters (like in Ireland). Observe the changes. The results are spectacular! Allow children to submit their ideas. Their imaginative spirits will result in eccentric responses. Jot them down! Remember there are no wrong answers! We are aiming for observation not comprehension. The sun's white light is made up of coloured lights corresponding to the colours of a rainbow. These lights chang e direction and separate when they enter or exit water. This explains why you see seven colours on the wall or ceiling. The white light divided itself into seven rays of light: red, orange, yellow, green, blue, indigo (dark blue), and purple. Stand with your back to the sun. Hold the hose. Your caregiver must adjust it so the water sprays like a light rain. The principle is the same as in the first experiment. The seven coloured lights which merge into the sun's white light separate when they penetrate the droplets of water and reflect towards your eyes. Prepare a cake mix with your group and divide it to make individual cupcakes. Prepare homemade icing and add a few drops of yellow food coloring (to represent gold). Let children ice their cupcake. Add "Corn Pops" cereal on top to represent gold nuggets. You may also add a small rainbow using candy. Add green food coloring to your recipes to add a St. Patrick's Day touch. You may also purchase green sugar which may be used to decorate cakes, cookies, etc. Add green food coloring to children's milk. Empty one or two boxes of lime Jell-O in a bowl (the powder is white when dry). Sprinkle this magical powder on apples, applesauce, vanilla pudding, etc. When the powder is moistened it turns green, like magic! Cut a pepper in two horizontally (the shape will look like a shamrock). Dip the pepper in paint (green or other color) and make prints on a large sheet of paper. (Open models-shamrocks) Print several copies. Provide children with green tissue paper and scraps of green construction paper (various shades). Have them tear the paper into tiny pieces using their fingers. Have them glue the tiny pieces inside a shamrock shape. Let dry and display. (Open models - shamrocks) Print several copies on green paper. Ask children to apply glue to the shamrock shapes and add rice. You may also print the shamrocks on white paper and use green food coloring to dye the rice green. Cut a paper plate in half. Ask children to glue cotton balls on their half-plate to make it look like a cloud. Next, attach colourful ribbon to the bottom to represent a rainbow. Hang from the ceiling. Cut a shamrock shape out of contact paper. Let children fill the shape with a variety of green craft materials (feathers, paper, cardboard, confetti, etc.) Add another piece of contact paper on top and hang in a window. (Open models-shamrocks) Print for each child. Deposit a small quantity of green paint in the center of each child's shamrock. Provide children with cotton swabs (Q-tips) and encourage them to use them to paint their shamrock. You may choose to add glitter to the paint for an added touch. (Open puppets-Leprechaun) Print the various models on cardboard. 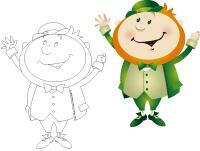 Ask children to cut them out and decorate them with various St. Patrick's Day craft materials. Glue the puppet to a Popsicle stick. (Open craft-articulated leprechaun) Print for each child. Have children cut out the pieces and color them. Assemble them by adding fasteners where indicated. (Open craft-miniature leprechaun) Print, cut out, and color. Glue the pieces on an empty toilet paper roll. Hang from the ceiling. (Open craft-St. Patrick's Day hat) Print and cut out. Have children color and decorate their hat. Help them assemble their hat and parade around the daycare. (Open mandalas-shamrocks) Print for each child. Invite children to color the mandalas to relax throughout the day. 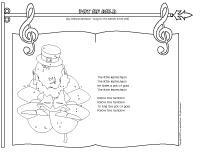 (Open coloring pages theme-St. Patrick's Day) Print for each child. (Open creative coloring-St. Patrick's Day) Print for each child.